Do you like the look of wood siding, but are leery about the cost and maintenance of painting it every five years? Consider fiber cement siding products. 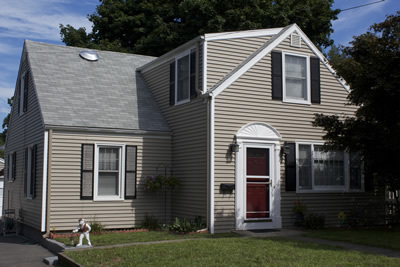 Connecticut home and business owners can enjoy years of beautiful siding without the cost of frequent painting. Fiber cement sidings look and feel like real wood…without the hassle. Fiber cement siding is a composite of sand, cellulose fiber and cement, shaped to resemble wooden shingles. This product is available in a rainbow of colors, from tan to forest green to even red. If you'd like to explore adding fiber cement siding to your home or office building, let Berkeley Exteriors show you how affordable and how stress-free the entire process can be. We have more than 20 years experience working with siding and other exterior building products, and we're proud that more than 75 percent of our new business comes via recommendations from satisfied past customers. To set up a free consultation about adding siding, Connecticut residents need only call us at 203 877-4373. We look forward to working with you.